Hydrogen is an appealing option for fuel because it doesn’t emit carbon dioxide, Dai said. Burning hydrogen produces only water and should ease worsening climate change problems. Dai said his lab showed proof-of-concept with a demo, but the researchers will leave it up to manufacturers to scale and mass produce the design. As a concept, splitting water into hydrogen and oxygen with electricity – called electrolysis – is a simple and old idea: a power source connects to two electrodes placed in water. When power turns on, hydrogen gas bubbles out of the negative end – called the cathode – and breathable oxygen emerges at the positive end – the anode. But negatively charged chloride in seawater salt can corrode the positive end, limiting the system’s lifespan. Dai and his team wanted to find a way to stop those seawater components from breaking down the submerged anodes. Previous studies attempting to split seawater for hydrogen fuel had run low amounts of electric current, because corrosion occurs at higher currents. But Dai, Kenney and their colleagues were able to conduct up to 10 times more electricity through their multi-layer device, which helps it generate hydrogen from seawater at a faster rate. “I think we set a record on the current to split seawater,” Dai said. The team members conducted most of their tests in controlled laboratory conditions, where they could regulate the amount of electricity entering the system. 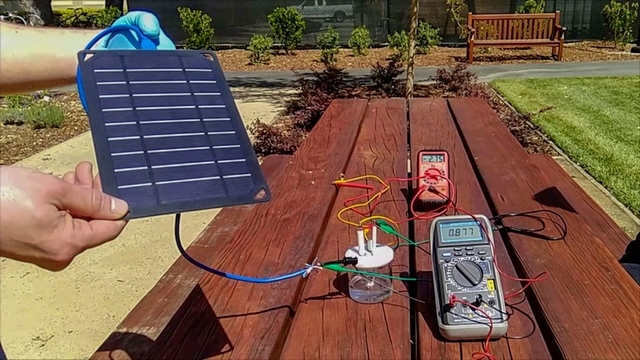 But they also designed a solar-powered demonstration machine that produced hydrogen and oxygen gas from seawater collected from San Francisco Bay. And without the risk of corrosion from salts, the device matched current technologies that use purified water. “The impressive thing about this study was that we were able to operate at electrical currents that are the same as what is used in industry today,” Kenney said. Looking back, Dai and Kenney can see the simplicity of their design. “If we had a crystal ball three years ago, it would have been done in a month,” Dai said. But now that the basic recipe is figured out for electrolysis with seawater, the new method will open doors for increasing the availability of hydrogen fuel powered by solar or wind energy. In the future, the technology could be used for purposes beyond generating energy. Since the process also produces breathable oxygen, divers or submarines could bring devices into the ocean and generate oxygen down below without having to surface for air. Other co-lead authors include visiting scientist Yun Kuang from Beijing University of Chemical Technology and Yongtao Meng of Shandong University of Science and Technology. Additional authors include Wei-Hsuan Hung, Yijin Liu, Jianan Erick Huang, Rohit Prasanna and Michael McGehee. This work was funded by the U.S. Department of Energy, National Science Foundation, National Science Foundation of China and the National Key Research and Development Project of China.